Beginning with enchantment and a spell, this book seems like a fantasy. But it continues on to become a kind of historical fiction. There are three main sections of the book, however, the character that bridges these sections is not a person, but a harmonica. 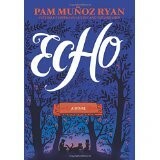 The story is very well written, as one would expect from Pam Munoz Ryan, an award-winning author. Each section of the book is a well-developed story in itself. In each case, the importance of music to our everyday lives is illustrated. The rhythm and rhyme of life are totally intertwined with the music we hear and make. The spell set forth at the beginning of the book can only be broken when the harmonica is used to save someone’s life, as does happen in the last episode in the book. Besides many literacy skills that can be taught using this book, there is a great deal of American history, German history, music history, as well as the history of the harmonic itself as an instrument, all that qualifies as material for fulfilling the core curriculum standards. While librarians and teachers will probably not use the entire book, due to its length, it can be introduced by sectional readings. Still it would make a great present for a middle grade student who loves to read about adventures of the past. It also opens the door for great discussions about how our lives might intertwine with others through the medium of music and/or shared possessions. It is an interesting and thought provoking book.